Now that the warm, summer weather is here, more and more people are on the roads, taking a ride on their motorcycles. However, this enjoyable summer pastime is not without danger. Because motorcycles are less stable and visible than cars or trucks, they are-unfortunately–more likely to be involved in a crash. And when motorcycles crash, riders are more likely to be injured or killed. In fact, the federal government estimates that per miles travelled, motorcycles are 29 times more likely to be involved in a fatal traffic accident than a car. According to the NHTSA, 5,286 motorcyclists died in crashes in 2016 alone. Because of their lack of protection, motorcyclists are also more likely to be severely injured in a crash. 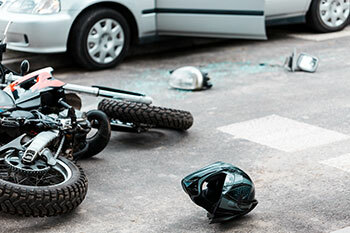 At The Collins Law Firm , we see first-hand the devastation that these motorcycle accidents can cause. We are currently representing a man who was seriously injured when his motorcycle was struck by a pickup truck. Check and recheck your blind spot. This is critical. Motorcycles are smaller than cars and SUVs and for this reason they are easier to miss. Missing a motorcycle in a blind spot may be the number one reason for accidents involving cars and motorcycles. Check your blind spot carefully and take your time merging. Slow down behind motorcycles. Motorcycles are much more sensitive to road conditions. They also react faster than cars. Both of these can cause a situation where an accident is inevitable. Slow down when following a motorcycle to give yourself more reaction time. Be especially careful when passing. Even though you can lawfully pass a motorcycle in the same way that you pass other vehicles on the road, this can be dangerous for the motorcyclist. The gust of wind that is caused by your increased speed can blow the motorcyclist off the road or cause his motorcycle to become unstable. Signal your intention first and leave lots of room between you and the motorcyclist before returning to your lane. Do not tailgate. Tailgating and motorcycles do not mix. Motorcycles react more quickly than cars do and your slower reaction time could cause you to rear end a motorcycle. This type of accident can be fatal to the rider especially if you are travelling at a high rate of speed or are driving a large vehicle like a truck or SUV. Use your turn signal if you are turning. If you have a motorcycle behind you, turn your turn signal on earlier than you normally would to keep the motorcycle from hitting you. Beware of intersections. Many automobile accidents occur at intersections, making this an especially dangerous area for motorcyclists. Always follow safety protocol at intersections: stop completely, obey traffic signs and signals; look both ways and proceed through the intersection slowly if motorcycles are present. Heed weather warnings. Bad weather makes driving on a motorcycle extremely difficult and sometimes dangerous. Rain, ice and snow can make driving treacherous. Windy conditions can blow lighter motorcycles off course, and weather conditions can make motorcycles difficult to see. In bad weather be sure to drive slower; stay farther away from other vehicles; and be aware of your surroundings, especially if there are any motorcyclists nearby. Remember that night driving is more dangerous for motorcyclists. When driving at night, increase your following distance; do not pass; and turn off your high-beams when a motorcycle approaches to keep the roads safe for riders. Stay in your lane. Do not attempt to share a lane with a motorcyclist. This is extremely dangerous, not to mention illegal. Motorcycles need their own lane for safety reasons. Be careful when taking a left turn. Always look a second time for motorcycles when you are taking a left turn. Accidents involving a turning car and an approaching motorcycle can be serious because the motorcycle is likely to T-bone the car. Take an extra second to be safe when turning. Minor accidents rarely happen when a motorcycle and an automobile collide. These accidents are much more likely to cause serious or fatal injuries. It is our responsibility to protect motorcyclists and keep the roads safe for everyone. If you or a loved one has been injured in a motorcycle crash, call the experienced motorcycle accident attorneys at The Collins Law Firm for help and a free evaluation of your case.